We are all aware of the fact that protecting our environment is something that each and every one of us is responsible for. We aren’t the only ones who know that, Green Day is actively involved in protecting the world we live in as well, which is why they have formed a partnership with the NRDC. The NRDC stands for the Natural Resource Defense Council, and as their name implies they are all about protecting our environment, along with ensuring that all the people and animals who occupy it can live safely, happily, and as free from environmental pollution as possible. The NRDC has been able to get over 1.2 million people involved in doing something to help their world out. From saving whales, to moving America beyond oil, the NRDC provides you with the information you need so that you can stay informed about what is happening in your world. They also acknowledge the younger generation, those who are under 18 and can’t vote. On the official Green Day and NRDC partnership website, there is a special section of the site devoted to the younger age group, specifically telling them how to get involved in all kinds of important issues. Green Day were very fond of the amazing things that the NRDC could help people accomplish, and were happy to team up with them. On November 17th, 2006 Green Day officially proclaimed that they were joining forces to launch a new campaign titled Move America Beyond Oil. In one of the videos the band put out for the organization Billie Joe says that “We grew up in a huge refinery town, I learned at a young age just by the mere smell of it, sort of what the oil industry does.” The band’s own personal experiences are one of the main causes behind them being so actively involved in defending our environment. However, not everyone shares that same driving motivation to be devoted to saving the environment. Mike addresses this when he says that “You don’t have to be an environmentalist to appreciate clean water.” This statement is very powerful, and can apply to a lot more than just clean water. We have so many things that we take for granted, and we aren’t even aware of, clean water being one of them, and you don’t have to work excessively hard to make a difference. Green Day's conservation efforts aren't going without notice, and even the scientific community is taking notice. A Swiss botanist named Dr. Jason R. Grant recently discovered a new plant. He named his discovery Macrocarpaea dies-viridis. 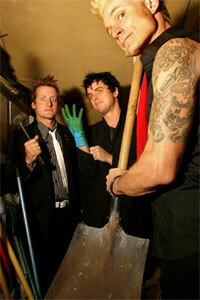 Dies-viridis is Latin for Green Day. The plant was found by him and his students in February of 2006 in southern Ecuador. Dr. Grant has discovered multiple species of plants in the Macrocarpaea family. The NRDC makes it very simple and easy for you to get involved. In the time you’ve spent reading this, you could have sent multiple emails out to representatives informing them that you want something done about the issues important to you. Adrienne Armstrong has said that the ability to send messages online is something she finds very useful with her busy schedule. You can also write letters, or you can receive information through text messages on your cell phone. You don’t have to be in a successful rock band to make a difference; you don’t have to be famous at all. Anyone can help! That is one of the main focuses, getting everyone involved and providing them with the information and tools they need to help make a difference. To help you become a part of the vital mission of the NRDC to save our environment, there are a few simple ideas they suggest. Do everything you can to save trees! Recycle, single space your papers, and buy notebooks made of recycled paper. Save electricity! : Turn off your computer when you aren’t using it, the same thing goes for the lights and other appliances. Make sure you keep your windows shut if you have the air conditioning on; it conserves a lot of energy. Save water! : Only run the water you need to, and make sure when you turn a faucet off, you turn it off all the way. If you ever discover a leak anywhere, at school or at home, tell the appropriate person so that it’s fixed before water is wasted. Aside from those tips if you visit the Green Day and NRDC website, it has a section where you can sign up to become an activist; all they need is your email address and you will receive all the updates you need to do your part in helping our environment. An article discussing available information on Foxboro Hot Tubs.